The unprecedented discovery challenges long-held ideas about how planets form. In a discovery that raises questions about long-held ideas about how planets form, astronomers have detected several enormous planets in orbit around a young star — in this case CI Tau, a 2-million-year-old star about 500 light-years away in the constellation Taurus. 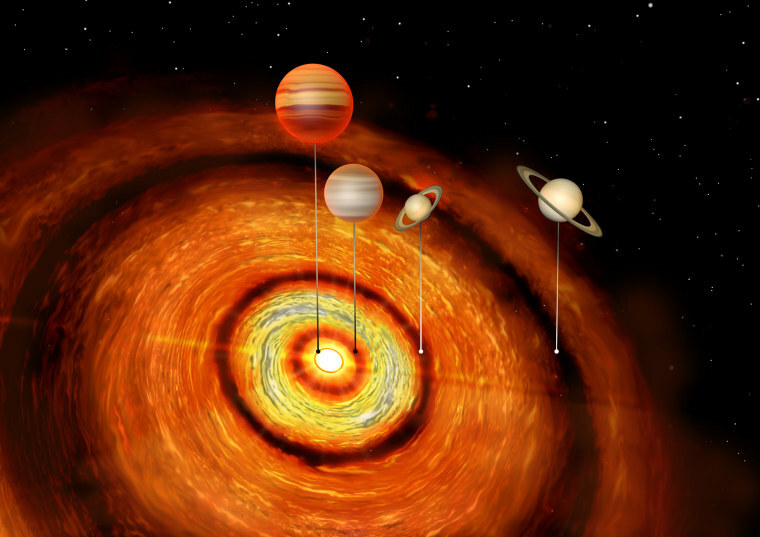 This is the first time multiple gas giant planets have been observed orbiting a "toddler" star. Our Milky Way galaxy is filled with stars that have been around for billions of years; our sun is about 4.5 billion years old. It's also the first time such extreme variation has been observed in the orbits of planets within a star system. The astronomers found that the outermost of CI Tau's known planets orbits at a distance 1,000 times greater than the orbit of its innermost planet, which is designated a "hot Jupiter" because of its size and its tight orbit around its host star. CI Tau's hot Jupiter, known as CI Tau b, was first observed in 2016 with help from the ALMA radio telescope in Chile. But when the international team of astronomers used ALMA to take a fresh look at CI Tau in the fall of 2017, they detected three gaps in the star's protoplanetary disk — the vast swirling cloud of ice and dust that surrounds it. The gaps are considered strong evidence of the presence of three additional gas giant planets around CI Tau. The discovery led the astronomers to question existing ideas about how long it takes large planets to form. "This is telling us that giant planets must form rapidly in the protoplanetary disk — which is in contrast to the most common model for planet formation, which involves a slow growth of a solid core followed by gas accreting onto it to form a gas giant planet," Farzana Meru, an astrophysicist at the University of Warwick in England and a co-author of a paper about the research, told NBC News MACH in an email. Cathie Clarke, a University of Cambridge astronomer and the paper's lead author, said in an email that it was unclear just how common systems like CI Tau are. But she said the research shows that "planetary systems are even more diverse than we thought," adding that the past two decades of exoplanetary discoveries "have shown us time and time again that we need to adjust our theories in light of new data." New ideas about planetary formation could lead ultimately to new ideas about the origins of life. "You want to know how planets form because that's the source of life in the universe," said Jackie Faherty, an astrophysicist at the American Museum of Natural History in New York City, who wasn't involved in the new research. In light of the new discovery, she said, "the pathway to getting life in the universe" may be more varied than we have realized.